Over recent years, a range of spectacular archaeological sites have been excavated. Because of recurrent phases of inundation and alluviation, there is a proven potential for extensive, buried, waterlogged, archaeological and environmental deposits belonging to the earlier landscapes, which extend beyond the seawalls and banks into the intertidal mudflats. These include the remains of Neolithic/Bronze Age settlement sites, as evidenced by human footprints, lithic finds, butchered animal bone, brushwood trackways and roundhouses (e.g. in the vicinity of Collister Pill). The national importance of the inter-tidal area for its uniquely rich archaeological and historical resource is recognised by its inclusion in the Gwent Levels Registered Landscape of Outstanding Historic Interest in Wales. The Levels are therefore a uniquely rich archaeological and historical resource in Wales, and certainly of international significance. 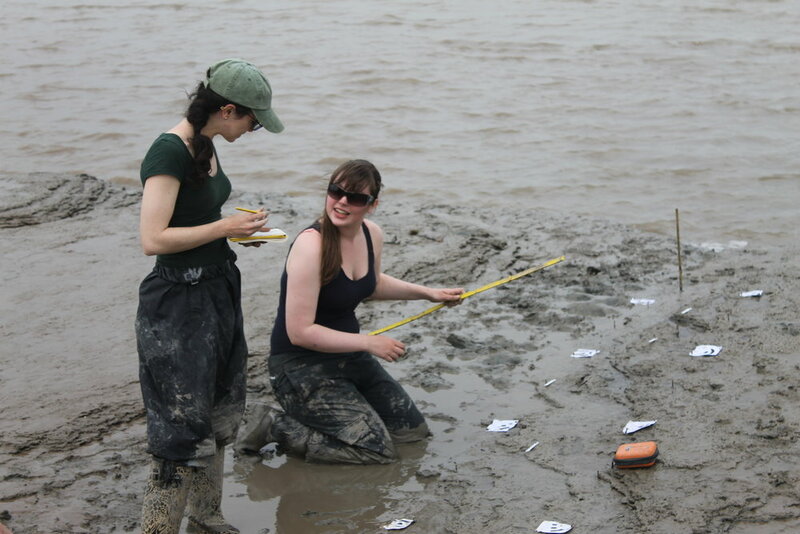 Archaeologists working on the foreshore, Goldcliff. Mesolithic footprint (c. 5,500BC), Goldcliff. The area is especially rich in prehistoric and Roman Period archaeology, as well as a diversity of field patterns ranging from the ancient semi-regular enclosure to the engineered 18th century fields. The unique drainage history and important farming and food production history have provided today’s communities with a strong sense of tradition and place. Examples of notable prehistoric features to the north of Wentlooge Level outside, but near the Registered Historic Landscape, include the early Bronze Age long barrow tomb near Cleppa Park visible from the M4; Gaer Fort, also known as Tredegar Fort and, locally, as The Gollars, on the western side of the City of Newport, an old hill fort site believed to be from the Iron Age; and an Iron Age Druid stone in the grounds of a private property in Michaelstone. Bronze Age activity has been recorded at various sites on desiccated raised peat beds, such as at Chapel Tump and Goldcliff. More recently, at Caldicot Castle there is detailed evidence of palaeochannels, pile structures, a boat strake (a strip of planking in a wooden boat) and a considerable amount of cultural material. Iron Age evidence has been discovered in the intertidal zone at Goldcliff, with rectangular timber buildings, trackways and fishtraps on a shelf of fen peat. Also outside, but near the area, at Barland's Farm, Wilcrick, Roman stone and timber structures have been found, along with the remains of a late 3rd Century Romano-British boat, emphasizing the remarkable state of preservation of archaeological material in and around the Levels. The Middle Ages are represented by a large number of Anglo-Norman sites including castles, moated sites, churches, mills, manor houses and court houses. There is evidence of continuity in the forms of land use between the medieval and post-medieval periods. The remains of a 13th-century boat, used for trading along and across the Severn Estuary, and perhaps with Ireland, were found buried in the mud of the estuary close to Magor Pill. The boat was found to have been carrying iron ore from Glamorgan. It is the largest wreck find of its period in Welsh waters and probably the largest found so far in the British Isles. The present landscape represents the latest archaeological period and provides the diverse ecological niches on which the nature conservation interests depend.